Optimize Recruitment is this week marking a major milestone in its success - ten years in business. Founded in February 2009, the professional recruitment company which is based at 10, Ormonde Street, has grown a business on recruiting quality personnel across a wide and varied number of indiustry sectors. Employing nine people, owner of Optimize Eoin Carey has seen his business steadily grown - and being recognised as a leader in its field winning awards such as a Chamber distinction in 2017. Remember 2009? Now at a very fertile ground to be sowing the seeds of a new business. And in particular recruitment - unemployment was over 13% and would rise further over the next four years. 200,000 people had lost their jobs, three quarters of those male. Eoin learned his trade in a recruitment sector particularly badly hit - a firm called Design and Build Recruitment - which he started with two other amibitious recruiters in 2005 having worked for two leading firms. But the property bubble burst, and newly married to Mary, Eoin returned to Kilkenny to set up Optimize, facing the challenge of setting up a company head on. “Optimize had candidates wondering what to do? These were people who had never been unemployed in their lives. Through no fault of their own, now found themselves in this unfortunately unique position and needed assistance. Examples include drafting a CV for the first time, the steps to take in order to make a career change, upskilling and adapting to change within the employment workplace etc,” Eoin explains. To coincide with Work Life Balance requirements and to minimise the commute to Dublin, Eoin decided in late 2008 that there was an opportunity in the market for a recruitment agency which could best fit the latest recruiting challenges being experienced by local companies in the south east region at that time. He identified that in the changing economic landscape the role of the recruiter would have to change and therefore the market now required recruiters to be more flexible to the needs of the employer and the jobseeker. And the first steps were taken to form Optimize. Dealing with clients was also challenging - everyone was looking short term. Companies know for example that they had work for a X number of employees for X number of months – but there was uncertainty after that. That was the key to recruitment during that time providing clients with a tailored flexible recruitment solution. Optimize provided clients across a range of sectors short term solutions, while working with candidates to try and optimise their career options. Optimize carries this recruitment philosophy to this day. “It was a difficult time, for sure” adds Eoin, “but I learnt a huge amount during that period and it has without a doubt assisted Optimize in the long term”. Optimize has been fortunately enough to build up a loyal base of clients and candidates. Those difficult early years provided an excellent insight into business in the South East region, getting to know your customer, the culture of the businesses and what is that works for them. Likewise, with job seekers all these variables need to taken into consideration when pursuing your next career move. As the company has developed over the last decade, Eoin has added innovative, customer focussed consultants to the team. Specialist consultants in different divisions, who are highly networked, has been essential to growth of the business. The importance of listening to all parties (clients & jobseekers) and understanding their needs has been instilled into the team. 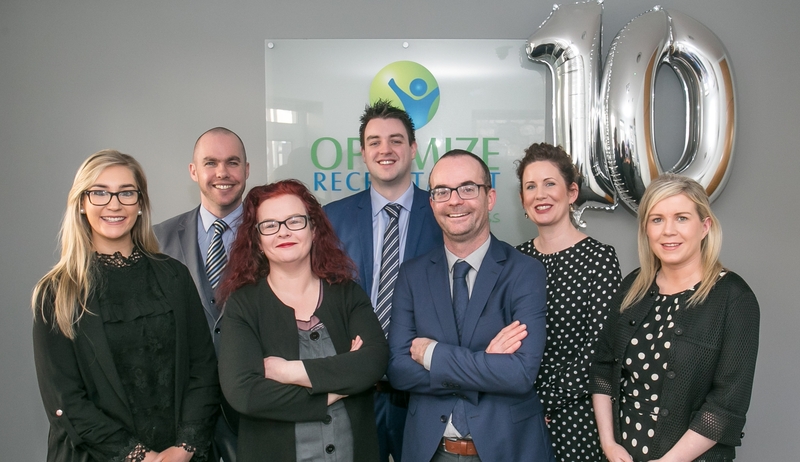 For now Eoin and Mary can look back at ten strong years for Optimize and the foundation laid for a comapny very much on the up - “We hope to grow the team and add additional pioneering recruiters to the team. But in an ever-changing employment environment, it is essential we continue to work closely with our existing clients and ensure we are servicing their recruitment requirements – building on the partnership we worked hard to develop in the firstly place,” said Eoin.